Introduction/Methods: A thorough computer search of the English surgical literature from 1884 to 2009 yielded 70 reports of Intraluminal Duodenal Diverticulum representing 81 cases identifying age of onset, length of symptoms, symptoms on presentation, pre-diagnostic imagery, extra-duodenal congenital abnormalities, web attachment and juxtaposition to ampulla, as well as diverticular dimensions and aperture size. 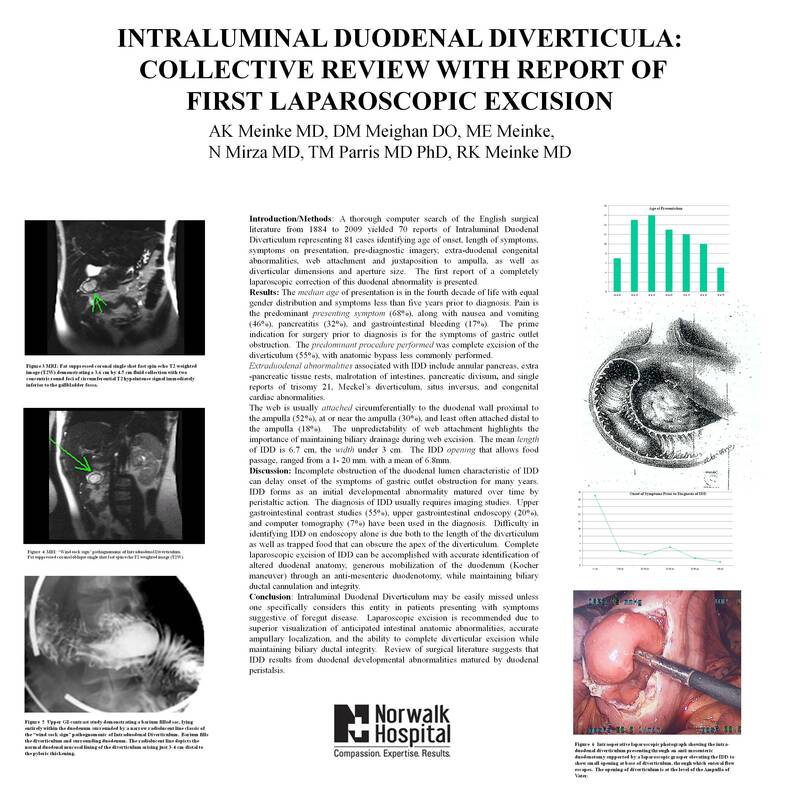 The first report of a completely laparoscopic correction of this duodenal abnormality is presented. Results: The median age of presentation is in the fourth decade of life with equal gender distribution and symptoms less than five years prior to diagnosis. Pain is the predominant presenting symptom (68%), along with nausea and vomiting (46%), pancreatitis (32%), and gastrointestinal bleeding (17%). The prime indication for surgery prior to diagnosis is for the symptoms of gastric outlet obstruction. The predominant procedure performed was complete excision of the diverticulum (55%), with anatomic bypass less commonly performed. Extraduodenal abnormalities associated with IDD include annular pancreas, extra -pancreatic tissue rests, malrotation of intestines, pancreatic divisum, and single reports of trisomy 21, Meckel’s diverticulum, situs inversus, and congenital cardiac abnormalities. The web is usually attached circumferentially to the duodenal wall proximal to the ampulla (52%), at or near the ampulla (30%), and least often attached distal to the ampulla (18%). The unpredictability of web attachment highlights the importance of maintaining biliary drainage during web excision. The mean length of IDD is 6.7 cm, the width under 3 cm. The IDD opening that allows food passage, ranged from a 1- 20 mm. with a mean of 6.8mm. Discussion: Incomplete obstruction of the duodenal lumen characteristic of IDD can delay onset of the symptoms of gastric outlet obstruction for many years. IDD forms as an initial developmental abnormality matured over time by peristaltic action. The diagnosis of IDD usually requires imaging studies. Upper gastrointestinal contrast studies (55%), upper gastrointestinal endoscopy (20%), and computer tomography (7%) have been used in the diagnosis. Difficulty in identifying IDD on endoscopy alone is due both to the length of the diverticulum as well as trapped food that can obscure the apex of the diverticulum. Complete laparoscopic excision of IDD can be accomplished with accurate identification of altered duodenal anatomy, generous mobilization of the duodenum (Kocher maneuver) through an anti-mesenteric duodenotomy, while maintaining biliary ductal cannulation and integrity. Conclusion: Intraluminal Duodenal Diverticulum may be easily missed unless one specifically considers this entity in patients presenting with symptoms suggestive of foregut disease. Laparoscopic excision is recommended due to superior visualization of anticipated intestinal anatomic abnormalities, accurate ampullary localization, and the ability to complete diverticular excision while maintaining biliary ductal integrity. Review of surgical literature suggests that IDD results from duodenal developmental abnormalities matured by duodenal peristalsis.